Light-textured and full-flavored, this Popovers Recipe with Bacon and Goat Cheese is the perfect addition to any bread basket. They’re easy to make, too! When I think of spring, popovers immediately come to mind. Something about their puffed, crisp shells and tender, airy interiors fits so well with the lighter feel of the season. As a child, I remember being fascinated by their ballooned rise as my mother pulled them out of the oven. It always seemed like magic! We’d always eat the warm rolls with butter and honey (or sometimes, with strawberry butter, as served at our favorite destination for girls’ shopping luncheons). Over the years, I’ve experimented with seasonal popovers recipe variations, and decided to pair them with one of my favorite ingredients for spring: goat cheese. 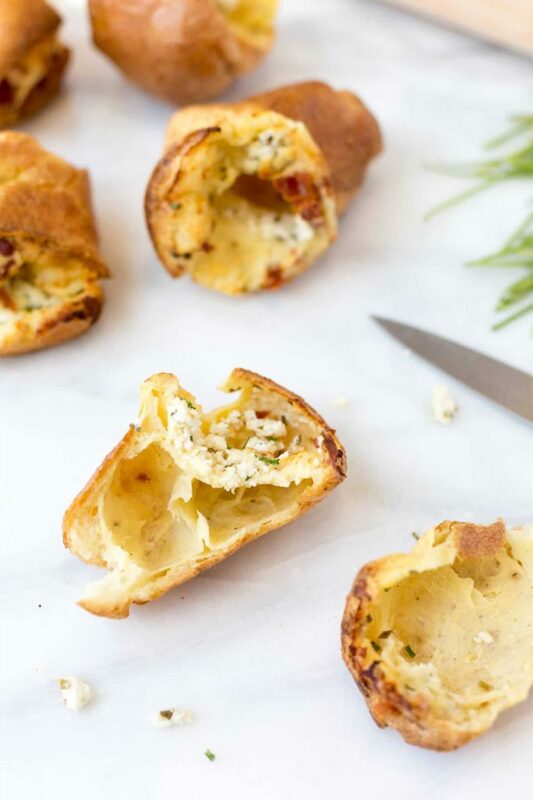 In these savory beauties, traditional popover batter meets salty bacon crumbles, creamy goat cheese, snipped fresh chives, and a hint of black pepper. 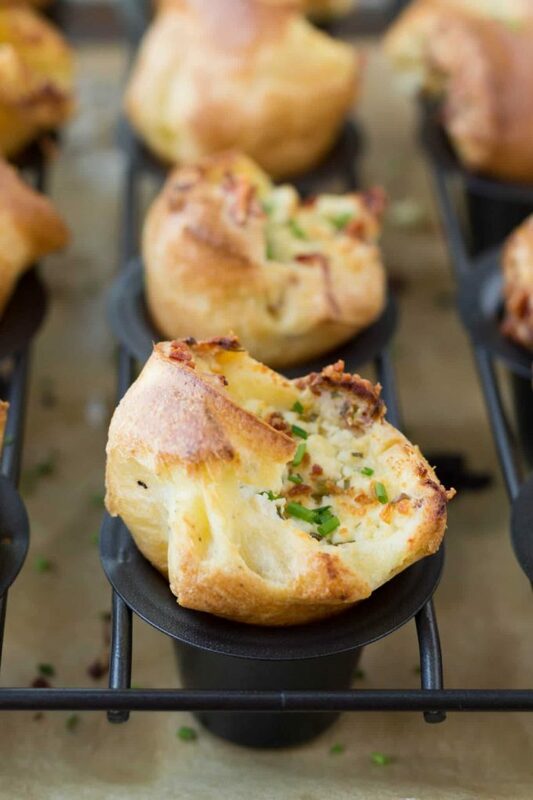 Light-textured, full-flavored, and easy to make, this Popovers Recipe with Goat Cheese and Bacon is perfect for any time of day: breakfast, brunch, lunch, or dinner! “Popovers” get their name from how the batter rises in the pan and “pops” over the tops of the wells. Considering that you’re only pouring a few tablespoons of batter into each well, the rise is quite dramatic. It’s fun to watch them through the oven door as they bake. Popovers are similar to British Yorkshire puddings, which are baked with the drippings from roasted meats instead of melted butter or cooking spray. The base of both batters is a simple mixture of milk, eggs, flour, and salt. Some popover recipes call for using a blender, but I’ve found that hand-mixing with a whisk produces a more tender final product and doesn’t take much longer. 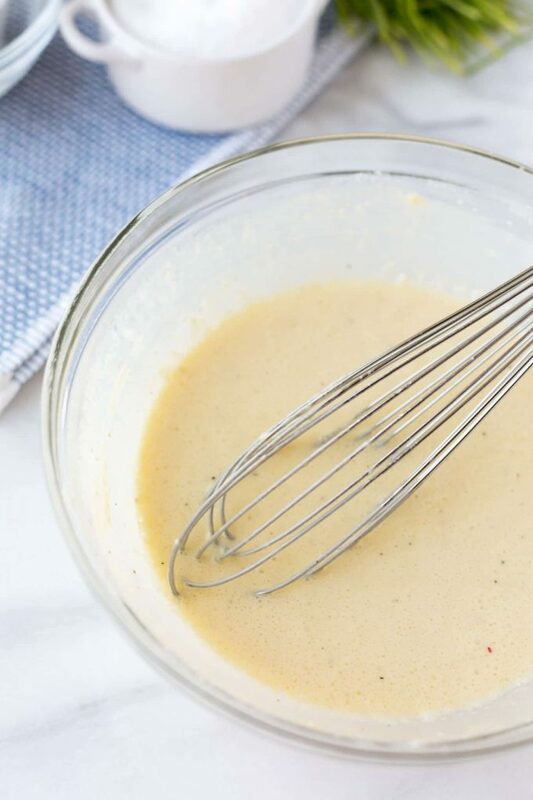 The ratio of wet to dry ingredients will yield a thin batter, somewhere between the consistency of half and half and heavy cream. The liquids create the steam needed to make the batter rise, puff, and form the popover’s characteristically hollow center. Your popover pan needs to be preheated with your oven so that you’re pouring the batter into hot wells. The eggs and milk should be at room temperature. Batter made with chilled ingredients will not rise as well. Start the popovers in an extra-hot oven (425 degrees F), lowering the temperature after they’ve “popped” (20 minutes) and baking until golden. I’ve found that the deeper the color, the better the popovers retain their shape. Resist the temptation to open the oven door during baking, or your popovers will deflate! When filling with cheeses, especially softer varieties like the goat cheese used in this popovers recipe, placing the pan on a lined baking sheet is essential. As the batter rises, it’s inevitable that a bit of the cheese will bubble out. Much like soufflés, popovers are best served immediately after baking. As soon as they come out of the oven, pierce the top or side of each roll with the tip of a knife to release the steam. This will help them hold their shape and texture for a few extra minutes. If you don’t have a popover pan (I’ve used a 12-cup mini popover pan here), a standard muffin tin also works well. Popover pans have deeper, straight walls, which will encourage a higher rise. Though they will be shorter and a bit wider, rolls baked in a muffin tin are still delicious! Read: Popover Pans: Are They Necessary for Perfect Popovers? from Kitchn. Bringing a gorgeous basket of popovers to the table is an easy way to make any meal feel a little more special. Just whisk, fill, and bake! These light and airy popovers with bacon and goat cheese can be served with any meal from brunch to dinner. Don't miss the tips in the blog post above for perfect popovers, every time! Preheat oven to 425 degrees with rack in the lower third of the oven. Place a 12-well popover pan (preferred) or a standard, nonstick 12-cup muffin tin into the oven, on a lined baking sheet, to heat. In a small bowl, stir together goat cheese and chives. Set aside. Measure out flour, salt, and pepper, and set aside. 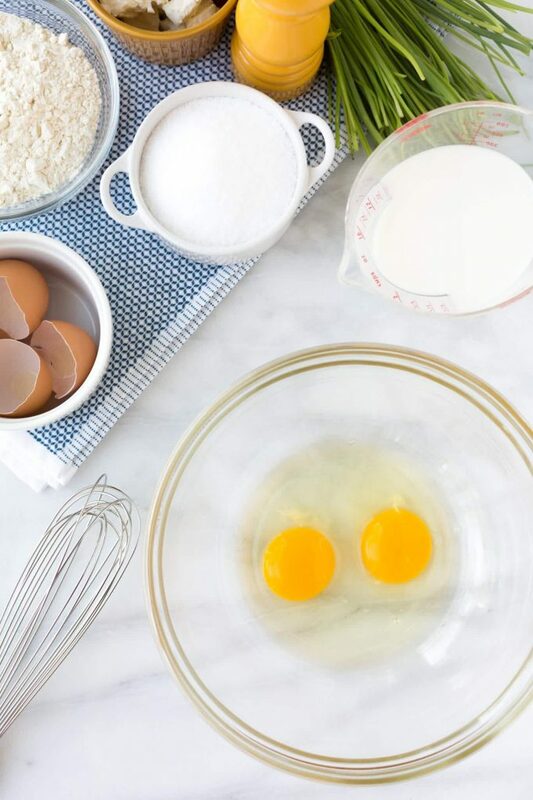 In a large bowl, vigorously whisk together milk and eggs until frothy, 1-2 minutes. Add flour, salt, and pepper, and whisk until just combined and only small lumps remain. Whisk in melted butter. Batter will be relatively thin, with the texture of cream. Remove popover pan from oven and coat wells with cooking spray. Fill each well about halfway with batter. 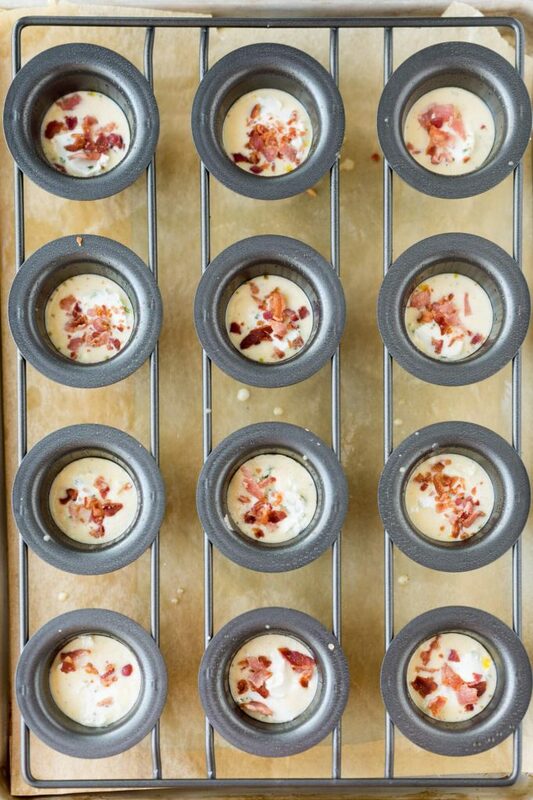 Spoon about 1 teaspoon of goat cheese into the center of each well and sprinkle with some of the crumbled bacon. Bake for 20 minutes, then reduce oven temperature to 350 degrees F and continue baking for about 15 minutes, until popovers are golden and tops are dry. Popovers will rise considerably. Immediately remove popovers from pan and use a sharp knife to pierce the sides of each to allow the steam to escape. For the crispiest exteriors, serve immediately. Using room temperature ingredients is very important to achieve popovers with the best texture and rise. If time is of the essence, the milk can be microwaved until just warm and the eggs can be placed in a bowl of warm water for 10 minutes. *Post originally published April 20, 2016. I’ve been on a popovers kick lately, and I absolutely love the goat cheese and bacon combo! Delicious! Oh my word. I have never tried popovers before but have always wanted to! I will definitely give this a try. I love the pairing of goat cheese and bacon together for a savory bread! Oh. my. GOD. I didn’t even know a popover pan was a thing, and it’s so freaking adorable. (Yes, kitchen tools can be cute.) I’m in love! I’m also loving the flavor combo here ‚ salt from the bacon, tangy from the chevre, and a flaky, buttery pastry. I think I need one of these pans. 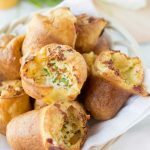 I’m a total sucker for appetizers that can offer up a variety of flavor combos and I’ve already thought of a handful of popovers I’d love to make — including yours! I love the addition of goat cheese to these popovers – it’s so savory and wonderful on it’s own, but especially in baked goods! Glad to know that I can just use a muffin pan since I don’t have a popover pan yet! I’m not sure what rock I’ve been living under, but I’d never heard of popovers until somewhat recently. I was listening to “the Splendid Table,” and someone called in because their popovers wouldn’t rise (they needed your tips! )… I had no idea what they were talking about! Now I do, and I want some! These look AMAZING! Isn’t goat cheese simply the best?? I could eat that cheese plain. We do love our popovers and you’re right they do remind me of spring. And I’ll be dragging our popover pan out and making this recipe. Love the touch of bacon along with the goat cheese. Oh my! Goat cheese and bacon. Two of my FAVOURITE things combined!! I haven’t had a popover in SO long and this is driving that craving home right about now. The flavour combinations are perfect too! I could eat 5 of these in one sitting. Well I LOVE goat cheese, Yorkshire pudding and BACON. How good do these sound? VERY!! I think I could actually make a meal out of these. My 3 favourite things are bread, cheese and wine….this fits right in. You just took me back to my childhood. My Aunt Heather ALWAYS made popovers for our family gatherings — it was her signature dish — and she had a special popover pan. I always loved hers, but these take it over the top. The tangy goat cheese sounds just perfect in these popovers and bacon — well that’s just a sucker punch isn’t it? Your photos are gorgeous, as always — and they’re having the desired effect. MUST MAKE POPOVERS. I absolutely love popovers! I use to eat them when I was a kid and we’d vacation to Wisconsin. The restaurant in the lobby always sold them and they were our favorite. Fast forward a decade later, I purchased a popover pan and have only used it once :( I will absolutely be making these popovers in my pan. The combination of bacon and goat cheese might be better than the ones I remember! The goat cheese here is EVERYTHING! Love that they can be made in a muffin tin too! Oh MAN do these look good or what!! 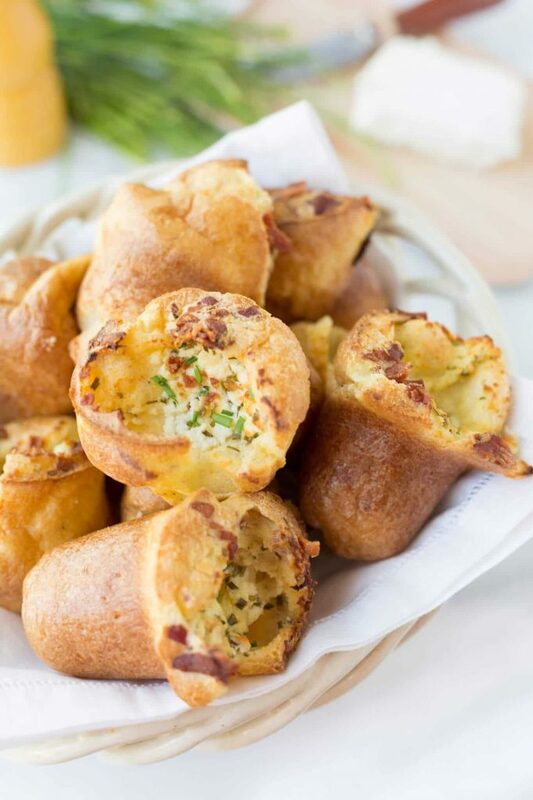 First you got me at “bacon” then “cheese”…but all in a popover….AWESOME!! Great tips on making popovers for newbies like me! These look amazing — I love the bacon – goat cheese combo and I actually have all of these ingredients in my fridge pretty regularly! Gotta save and try em soon!! Yum!